Four sacred works follow successively in Charpentier’s manuscripts: Pour la Feste de l'Épiphanie (for the Feast of Epiphany), In Circumcisione Domini (for the Circumcision of our Lord), In Festo Purificationis (for the Feast of Purification), and Pour le Jour de Ste Geneviève (for the Day of Saint Geneviève). Earlier in the notebooks is the Canticum in nativitatem Domini. The similar musical forces required imply that they were performed by the same ensemble of singers and instrumentalists. Their placement in the Mélanges autographes suggests that these works were composed during the Christmas season of 1676-1677. Such are the facts, the forensic evidence, offered up by Charpentier’s autograph manuscripts these works. From this we can broaden our understanding of them by considering the various Christmastide feasts and saint’s days for which they were intended. 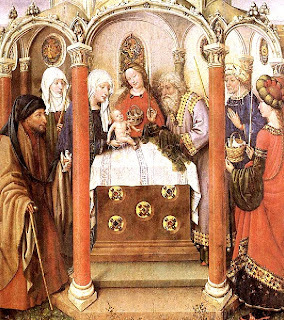 Upon bringing Jesus to the Temple, the family encountered Simeon, who had been promised “he should not see death before he had seen the Messiah of the Lord”. 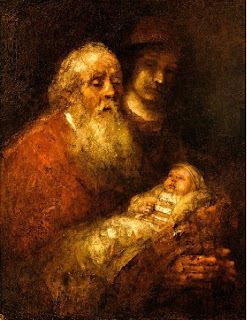 Simeon then prayed the prayer that became known as the “Nunc Dimitis” or the “Canticle of Simeon”. Lord, now lettest thou thy servant depart in peace, according to thy word: for mine eyes have seen they salvation, which thou hast prepared before the face of all people; a light to lighten the Gentiles, and the glory of thy people Israel. Charpentier’s text is taken from Luke 2, verses 25-33, with the usual words of adoration appended. Another name for this is the Feast of the Purification of the Virgin. Under Mosaic law as found in the Torah, a mother who had given birth to a male child was considered unclean for 7 days; moreover, the new mother was to remain for 33 days “in the blood of her purification”. This feast therefore falls on the day which, according to Jewish law, Mary should have attended a ceremony of ritual purification. The gospel of Luke relates that after Jesus’s presentation in the Temple Mary was purified according to the religious law. This feast also became known as “Candlemas”, which refers to the practice whereby a priest would bless the beeswax candles with holy water and distribute some of them to the faithful for use within their homes. In Poland this feast is called “Matka Boska Gromnicza”…”Matka Boska” meaning “Mother of God”, and “Gromnicza” meaning beeswax candle. 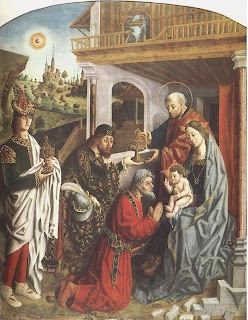 The image captures a Polish legend and is associated to Candlemas Day celebrated on February 2. 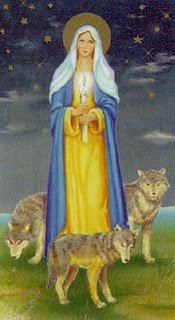 The legend relates that Mary, the Mother of God of the Candle (Matka Boska Gromniczna), watches over the people on cold February nights. With her candle she wards off the ravenous pack of wolves and protects the peasants from all harm. In Poland, dying persons are given the Gromnica to light their way to eternity. The final motet in this succession is entitled “For the Day of St. Geneviève”, which may provide some clues regarding the performing circumstances of the other three works. Saint Geneviève is the patron saint of Paris, whose feast is celebrated on January 3rd. She was a peasant girl born in Nanterre around the year 420, and who became a nun at age 15. On the death of her parents she went to live with her godmother in Lutetia…the Roman name for the city of Paris. There she became known for her piety and devotion to works of charity. She had frequent visions, which she reported in her prophecies. Shortly after Attila the Hun attacked Paris in 451, the panic-stricken people of Paris were persuaded not to abandon their homes. 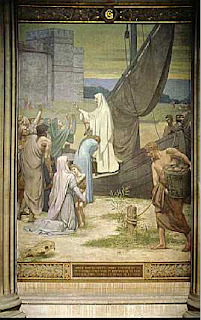 The diversion of Attila’s army to Orléans was attributed to Geneviève’s prayers. Then during Chileric siege of Paris in 464, Geneviève was able to pass through thee siege lines to Troyes, and she brought back grain to the starving city. 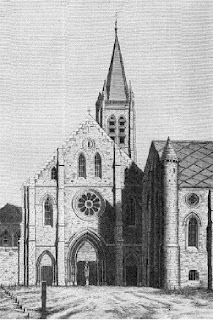 When Geneviève died in 512, King Clovis had her remains put in what became known as the Church of the Abbey of Sainte-Geneviève. Under the care of the Benedictines, the church was so named owing to numerous miracles that her associated with her tomb. In 1129, for example, when Paris was suffering from an epidemic of ergot poisoning, this “burning sickness” was halted after her relics were carried in public procession. The miracle occurred as the people approached Notre Dame de Paris, and were in the parvis before the cathedral. Afterwards, the little church was renamed Sainte-Geneviève des Ardents, which soon was honored with becoming a parish church. This did not take away the luster from Sainte-Geneviève du Mont, which owned the relics and kept them on display in the reliquary that would be taken in public procession. Do you know what a fine procession this is? All the religious orders, all the parishes, all the reliquaries, all the parish priests, all the canons of Notre-Dame, and the Archbishop, who processes on foot, pontifically blessing to the right and left, up to the cathedral. However he does only the left side, and on the right it is the abbé of Sainte-Geneviève barefooted, preceded by 150 monks also barefooted, with his crosier, his miter, like the Archbishop, and also blessing, but modestly and devoutly, and on an empty stomach, with an air of penance that shows that ‘tis he who will say mass in Notre-Dame. The Parliament in red robes and all the sovereign companies following the reliquary, which glitters with precious gems, borne by 20 men dressed in white and barefooted. At Sainte-Geneviève are left in hostage the provost marshal of the merchants and four counselors, until such time as this precious treasure is returned. You will ask me why they took the relic down from its place; it was to make the rain stop, and bring on the warmth. The one and the other came as soon as this plan was decided upon, so that, as it generally is done to bring about all sorts of good things, I believe that it is to her that we owe the return of the King. He will arrive on Sunday. 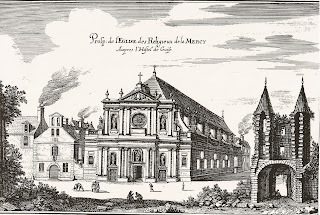 Given the place of the Sainte-Geneviève motet in the Mélanges, close to the motets intended for the Epiphany season, it is unlikely that Charpentier composed this work for the special procession of July 1675. Its title “Pour le Jour de Ste Geneviefve” (for the Day of Saint Geneviève) all but proves that it was intended for the annual Feast of Saint-Geneviève held on January 3rd (however…see below). It is doubtful that it was performed during the pontifical Mass celebrated at Sainte-Geneviève du Mont, for on this occasion the music would have been furnished by the musicians of Notre Dame. Yet, there are some internal clues in the text that suggest the event that prompted this piece, advances the possibility that it was performed on January 5th (rather than January 3rd), and the venue where it might have been performed. First of all, the anonymous text is non-liturgical, and so was presumably written specifically for this setting. That the words emphasize the “virginity” of Saint Geneviève, suggests that the motet was possibly intended for the “Feast of Sainte Geneviève Virgin,” celebrated on January 5th. 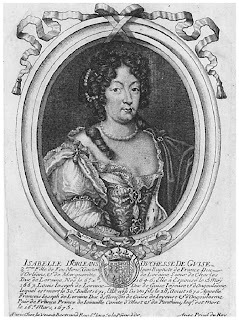 Who was Isabelle d’Orléans, Duchess of Alençon, known as “Madame de Guise”? As one of four daughter of Gaston d’Orléans—brother of Louis XIII—she was first cousin to Louis XIV and a close friend of Queen Marie-Thérèse. 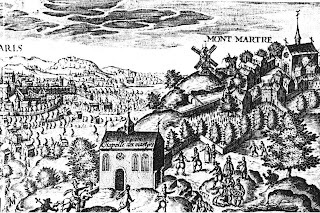 Mme de Guise had strong ties to the Abbey of Montmartre: her husband’s, mother’s and son’s hearts were buried there, and since the summer of 1675, Montmartre had been the residence of her sister, the Grand Duchess of Tuscany. Her cousin/aunt was Marie de Lorraine, Duchess of Guise, known as “Mademoiselle de Guise”. 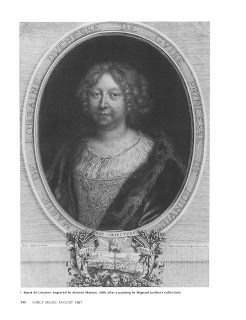 Charpentier is known to have composed music for her musical establishment in the 1670s and 1680s, and in turn he was provided with an apartment in the Hôtel de Guise (near the Hôtel de Ville) during this time. Both women were very devout. After Mme de Guise lost her infant son—the last male of the House of Guise—in March of 1675, both women became increasingly drawn to the cult of Virgin and Child. The tragedy that had plunged both houses into mourning brought an abrupt about-face in the preoccupation of the two Guise princesses. They sought consolation and new meaning for existence in the Mother and Child, and they decided that they could best serve the Christ Child by promoting childhood education. Patricia Ranum has suggested that the two Guise princesses were the material and spiritual protectors of two religious institutions that were founded that year: the "Hôtel de l'Enfant Jésus," and the "Institut des écoles charitables du Saint Enfant Jésus." 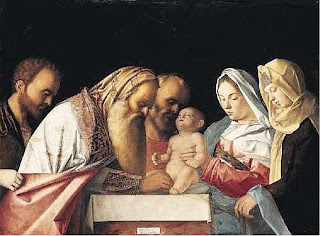 In Charpentier’s notebooks we find in succession music for the principal holidays for the Infant Jesus—Christmas, Circumcision, Epiphany, and Purification. It seems likely that Charpentier’s music was composed for the devotionals of the two Guise princesses. Its performing forces matches those used by the Guise establishment during these years: soprano, soprano, bass, 2 instruments, continuo. Where might this music have been performed? Possibly in the ground-floor chapel of the Hôtel de Guise, where Mlle de Guise lived. Or perhaps at the Church of Our Lady of Mercy, next to the Hôtel de Guise. Maybe at the chapel in the Luxembourg Palace, which was the principal residence of Mme de Guise. Or, still less hypothetically, especially as far as the motet for the Saint Geneviève motet is concerned, at the Abbey of Montmartre.